Locally grown seasonal food with a focus on health, wellbeing, creativity and flavour. 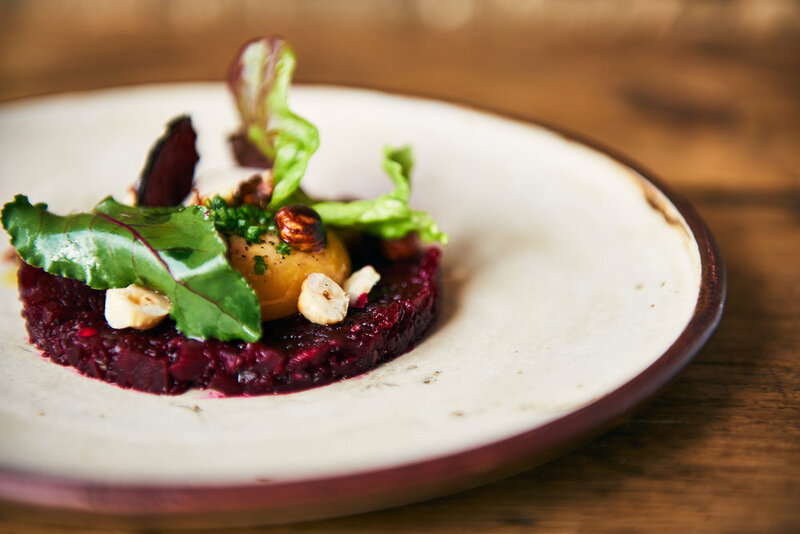 Inspired by the seasons, our menu uses only the best produce, grown as close to the restaurant door as possible. For this reason we offer a set 4 courses, which can change daily depending on the delivery from our local farmers and fishermen. All food is cooked with health in mind; John only uses ingredients and techniques that promote positive health and well- being. Every plate highlights the local produce of the season, passionately prepared and served. Our philosophy is great tasting food and zero wastage. We’re passionate about the produce we use in the restaurant, and we’re supporters of sustainability and organic farming. We personally visit the farms from where we source our meat - we know that grass fed organic farming methods deliver the best flavours to our menu. We also use the whole animal, supporting our belief in zero wastage. Our vegetables and fruit are seasonal and locally sourced. This means that they are always fresh and nutritionally beneficial to our bodies. The wines and beverages are hand picked to match the dishes being served, they follow the same organic, natural ethos of the restaurant. Westminster trained John Lawson started his career at Le Manoir aux Quat'Saisons. His training with Raymond Blanc saw him go on to work in two and three Michelin star restaurants in France, UK, USA and Australia, restaurants including; Daniel Boulud’s and Gordon Ramsey at The London, New York. John has been a private chef for The Sultan of Oman and a high profile Celebrity family. He made an appearance on MasterChef as well as cooking at the Australian Open in 2014 and 2015. He went on to be awarded a Chef's hat (michelin star) at his restaurant in Melbourne, No 8 by John Lawson. In 2016 John was diagnosed with a brain tumour, his on-going recovery has been mainly as a result of the food he eats. Real food, cooked to nutritionally support the body. He opened FOOD by John Lawson in June 2017 to share his love of good food with the hope of inspiring us all the eat 'Real Food'. Jasper's passion for cooking started at a young age, always enjoying watching and participating in all things food! John has taught and mentored many young chef's throughout his career and Jasper is proving to be one that stands out and has the potential of being a great chef in the future. We are proud to have Jasper as a part of the kitchen.